Star Wars Princess Leia 12 oz. 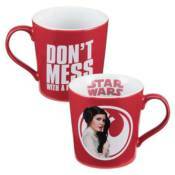 Ceramic Mug:That sounds like good advice� especially if said princess is holding a blaster! This red Star Wars Princess Leia 12 oz. Ceramic Mug boasts a bold and bright design on one side that shows lovely Leia with her pistola, while the other side states "Don't Mess with a Princess." There are even graphics on the inside! Made of high-quality stoneware, the 3 3/4-inch tall mug features an exclusive shape and comes in a full-colour gift box. It's dishwasher and microwave safe. Ages 13 and up.